Sometimes the simplest of backgrounds make for the most dramatic wedding photographs. In this picture the deeply textured contemporary wall located in this luxury hotel provided an amazing backdrop for this fashion-inspired wedding photograph of the bride. 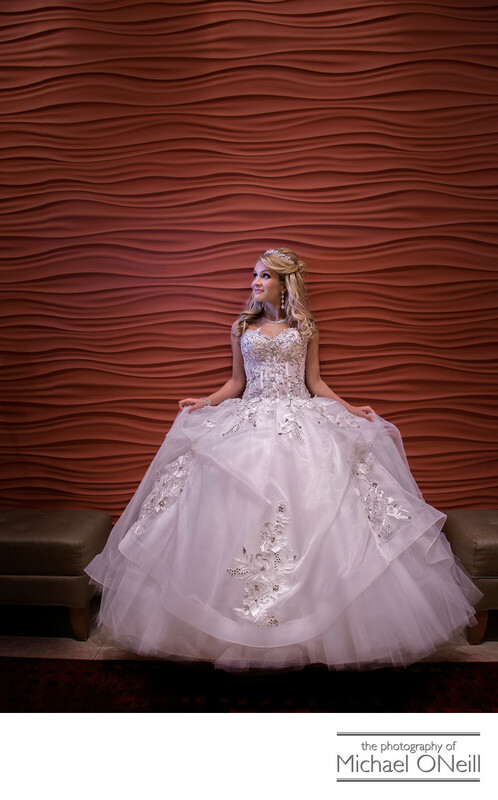 Showcasing all of the detail in her magnificent designer wedding gown was the mission of this photograph. The simple background does nothing to distract the viewer’s eye...which is drawn in to focus on all of the delicate details of her wedding dress. Simple, elegant and perfectly lit this full length image of an amazing bridal gown is one that every bride desires on her wedding day. This photo was taken at The Hyatt Regency Hotel. Similar contemporary backgrounds can be found at any of the luxury NYC hotels: The Waldorf Astoria, The Pierre, The Plaza and The Essex House to name just a few. As you explore this web site you will find other images captured within the confines of some of New York’s finest hotels. I love working at them all. Not only do they afford incredible photo opportunities but they all offer the finest cuisine and impeccable service. If you are planning a NYC wedding at any of the luxury hotels there, give me a call.